In Needham, the volume of water used on a summer day can be more than double the volume used on an average winter day. Lawn watering is almost exclusively the cause of this increase in water demand. Given that the summer is the time the Charles River is naturally the most stressed, becoming more efficient in our lawn watering practices can provide a significant benefit to the health of the river. In general, turf grasses need about 3/4" - 1" of water per week to maintain green color and active growth. The following tips will help you maintain a healthy lawn and garden while conserving water! Use a rain gauge to measure how much water you're applying. Overwatering does more than deplete the water supply, it also makes plants prone to pests and adds to stormwater runoff, which pollutes our water systems. By choosing and operating a watering system correctly, you can reduce water bills, insect and disease problems, and maintenance requirements. For example, the more you water your lawn, the faster it grows and the more it needs to be mowed. Nothing looks more wasteful than running your sprinkler while it’s raining. If your sprinkler system is on a timer, purchase and install a rain sensor and soil moisture sensor that automatically turns off the irrigation system. If possible, also avoid watering if rain is expected later in the day or during the next day. Your grass should be fine, even it looks stressed. Two inches is too short. The cut should be 3-3.5 inches. Make sure your mower blade is sharp so it makes a clean cut. Good soil is essential to having a healthy lawn. Use 4-6" of good quality topsoil and add compost to provide nutrients and improve the soil texture. In general, 1 inch of water will penetrate sandy soils to 12 inches, loamy soils to 6 to eight inches, and clay soils 4 to 4 inches. Using these estimates isn't quite as accurate as digging, but it's pretty close, especially if you have a good knowledge of your soil composition. 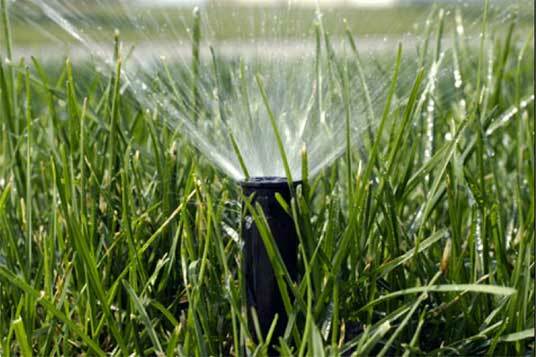 To figure out how long you need to keep your sprinkler or sprinkler system on, calibrate your sprinklers. Place 5 or 6 flat-bottomed containers (such as coffee mugs, tin cans, cake pans, etc.) on your lawn. Distribute them as evenly over your lawn as possible, keeping them at least 2 feet from the sprinkler heads. Turn on the sprinkler system so that the containers begin filling with water. After 15 minutes, turn off the system. Use a ruler or tape measurer to determine the depth of water in each container. The measurements will probably be between 1/8 to 7/8 of an inch.